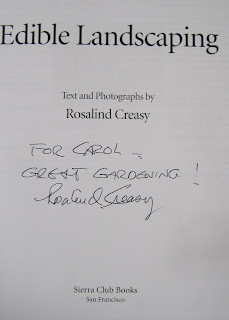 I was one of the last in line to have my copy of Edible Landscaping by Rosalind Creasy signed by none other than Rosalind Creasy a few weeks ago on a gorgeous Sunday afternoon. 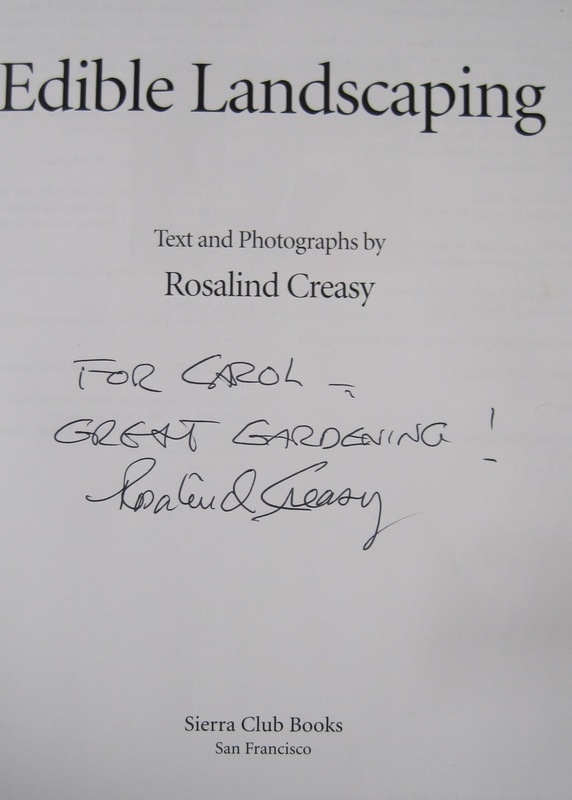 She had just given a talk at the Indianapolis Museum of Art about edible landscaping. Images of overflowing, abundant, colorful, taste tempting fruit and vegetable gardens ran through my mind, along with her encouraging, insightful words. The previous day, I had attended an all day conference sponsored by the Indiana Native Plant and Wildflower Society (INPAWS). Images of native plantings, striking in their natural beauty, attracting a variety of wildlife ranging from colorful insects to songful birds filled my mind. The dichotomy! A native, edible landscape in Indiana would consist of… and I began to make a list of what I knew was native to Indiana and edible, too. Walnuts, pawpaws, tiny serviceberry berries and, oh yes, morel mushrooms if you can find those nearly mythical fungi in the springtime, and I’m sure lots of other plants that I don’t even realize are edible. Creasy had the perfect response. I paraphrase… Think of the benefit we are having on the environment when we grow and eat food that is as local as our own front or backyard. That means less food had to be shipped, railed, trucked, flown or carted from distant states and countries to our kitchens. And that, too, benefits our environment. Native plants or edible landscapes? There is room for both in my garden. No, you can't have my book, but I encourage you to buy your own copy ! Oh, I really want this book. It's on my Christmas list. My copy of her original edition is worn out, but I hear this one is much better. That was a great answer about edibles and natives - I find myself thinking about that contrast often too. Yes, it doesn't have to be either/or. It can be both! I had a duh moment last year, while staring out the kitchen window at my herb garden at all the lovely things that were weathering the winter cold. Gee, oregano, lavender and rosemary still look so pretty---why can't the front yard look so good. Yes, why can't it? I have all three in the front yard beds now, and they look great. This looks like a great book. I will add it to my list of wants. I love to grow edibles in the garden and have so much unused space. Gotta have this book, Carol. The cover says it all. I want a garden like that. First post poster, but long time reader....just a quickie thank you note for the work on your blog....I like reading it very much! 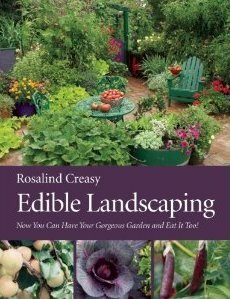 Rosalind Creasy has been promoting edible gardens for a long time, and it looks like the rest of the world is catching up to her. The book looks great. It's on my Christmas list.